San Diego — The final piece to a 2.1 million square-foot Murphy Development Co. business park in Otay Mesa is falling into place with construction of a 79,050 square-foot building at 8500 Kerns St.
Murphy Development broke ground on the $11.9 million building this month. It’s one of 16 in Murphy Development’s Siempre Viva Business Park, with more on the way in Murphy Development’s nearby Brown Field Technology Park. The company is one of the most active developers in Otay Mesa, and its decision to move forward on the projects before signing up tenants demonstrates the company’s confidence in the Otay Mesa submarket. A 121,970 square-foot adjacent building, completed in 2016, has been partially leased to Mainfreight USA, which occupies 24,050 square feet of space. Other tenants in Siempre Viva Business Park include General Dynamics and Federal Express. Andy Irwin, vice president for industrial tenant representation with the commercial real estate brokerage firm JLL, said vacancy rates for industrial property in Otay Mesa have reached historic lows and rents have jumped 47 percent since the start of 2015. Irwin and Joe Anderson of JLL are leading leasing efforts for the final portion of Siempre Viva Business Park. “Very little development has occurred in the market, leaving a robust tenant pool with few options,” Irwin said. The new building will have a 28-foot clear height, 2,000 amps of 277/480 volt power, manufacturing sewer and water capacity, early suppression fast response sprinklers, concrete truck courts, wide column spacing and high dock door ratios designed for distribution users. Arduino said the business park has been designed to give it less of an industrial feel, in part through its landscaping. Working with Murphy Development on the final building in Siempre Viva is architect Gene Cipparone, K&S Engineering, and Lusardi Construction Co..
As the work is wrapping up, Murphy Development is about to start final grading and infrastructure work on the 3.2 million square-feet Brown Field Technology Park, which it started developing in 2013. Work on the Brown Field Technology Park was “kind of on-again, off-again over the years” since 2013 while Siempre Viva was being built, Arduino said. With the Otay Mesa commercial real estate market strengthening, the time is right for development to resume, she said. “We can put a building up within 12 months there,” Arduino said. 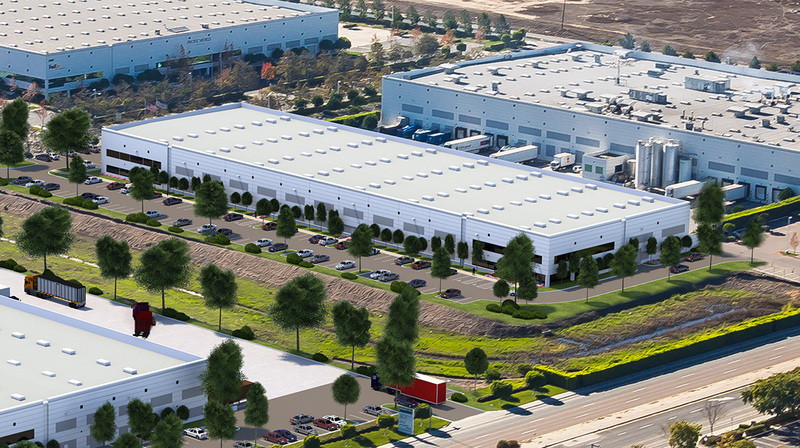 In addition to its Otay Mesa projects, plans are in the works by Murphy Development for construction of a 164,000 square-foot building in its Scripps Ranch Technology Park, with construction expected to finish in 2019.